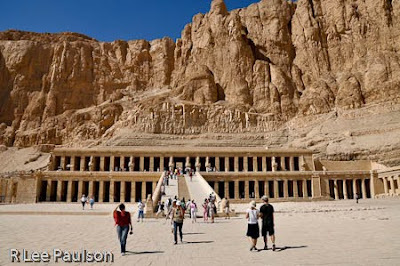 West continues, "Partly built against the cliff face, partly cut into it, Hatshepsut's temple seems assimilated into its natural setting; an analog of the magical act of creation itself. 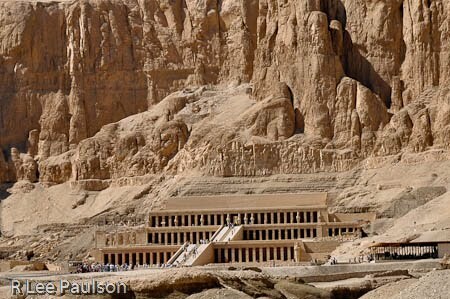 For just as the primordial neterw (Egyptian word for 'gods') brought life and order out of the mud of the primeval swamp, so Hatshepsut's great architect, Senmut, wrought a masterpiece of elegance, harmony, and proportion of the gnarled, buff antiquity of the cliff face. It would be difficult to conceive of a more perfect marriage between nature and art than this exquisite terraced temple that is both a mortuary temple for the queen and an monument to the glory of Amon." Amon would be the ancient Egyptian's name for what we might call The One God. 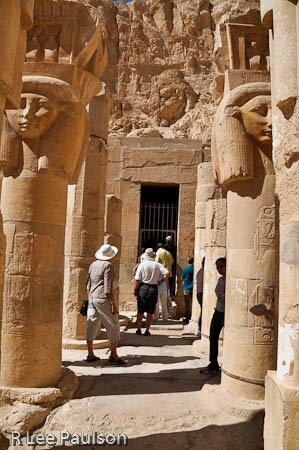 We all know that the ancient Egyptians had many 'gods'. However, even most of us have been led to believe differently, the ancient Egyptians were very clear that, in their belief system, all other 'gods' or neterw, as the ancients called them, are simply different aspects of The One god, which they called Amon. I have just climbed the first staircase seen in the photo above and am standing in what must be a ten acre forecourt between levels one and two. The size of this court was shown in the aerial photo (post 25) taken that morning from the balloon. Yet, when one stands at the base of the first staircase, one really has no idea this forecourt exists at all. 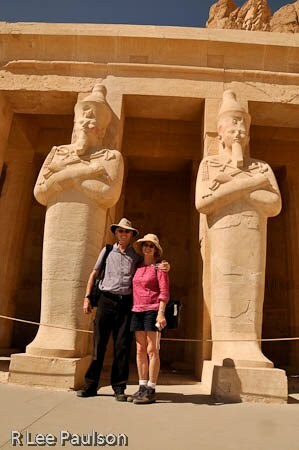 It has been difficult for me to hide my sarcasm when I hear that mainstream thinking still believes that the ancient Egyptians got their ideas about proportion and harmony from the Greeks. I dare anyone to stand in front of this majestic monument and say that with a straight face. In addition, the designer of this place also had to also have been very aware of the laws of perspective. As one can see from the first photo, from a distance, the illusion that one is looking at a single, three level structure is perfect. I am now standing about two thirds up the second stair case looking down on the forecourt. 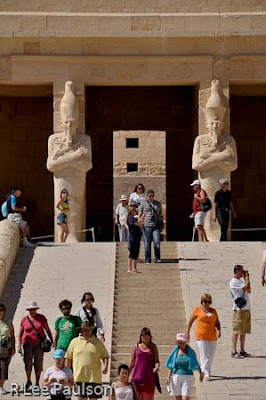 West says that after the pyramids and Akhenaten, Hatshepsut and the facts of her reign represent the next most enigmatic mystery. 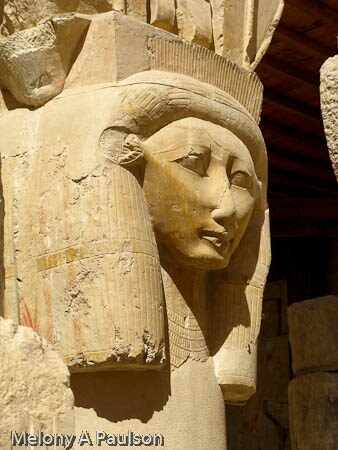 Hatshepsut was the only known woman who ruled Egypt both as a female and as a symbolic male pharaoh. Stories of palace intrigue during her reign abound. And, as is usual with ancient Egypt, there are different, conflicting theories about how a woman was able to not only rule Egypt as pharaoh for twenty years, but also build impressive monuments such as this one. We are now half way up the second staircase. It is just after noon and the place, as you can see, was crowded with people. Notice the headdresses on the two statues above are different. I do not know what that signifies. 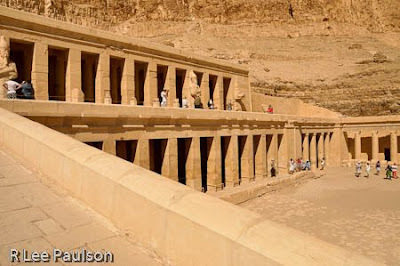 After her death, Hatshepsut's name was erased from the list of kings. Clearly, those who came after her did not consider her a legitimate ruler. Her name was not present, for example, in the list of kings we saw at Abydos. And, after her death, her name was removed from some, but not all of the inscriptions here. 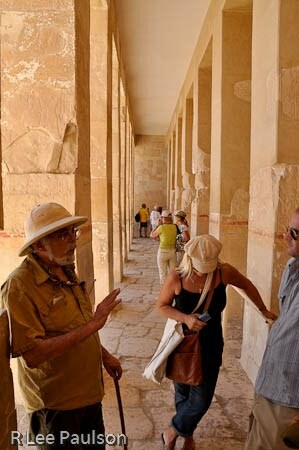 The some but not all part has puzzled Egyptologists for years. Clearly, the ancients could have erased her name from all the inscriptions had they desired. But, they did not. Nor did they stop using this site as a healing temple after her death. Melony and I stand on the top most level, just to the right of the doorway in the photo above. Sadly, we were not allowed to venture inside the temple rooms, as one can see by the rope above. However, as you can see in the above image, the rooms do extend quite a ways back into the cliff. 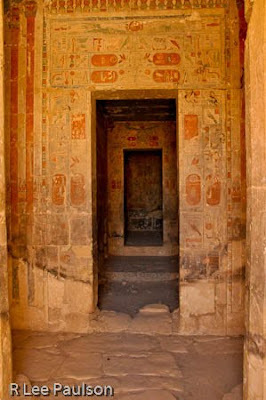 Notice how much of the coloring is still left on the inscriptions. Other rooms extend even deeper into the cliff face. We are off to the left in this photo. Notice the images of Hathor on the columns above. This was also a healing temple and we notice, with some degree of curiosity, that the images of Hathor have not been defaced as in Dendera. Melony took this photo and the one below. Here, one can clearly see how Hathor's face does indeed resemble a human uterus. Here she is from the side. Melony saved me with these photos as I had a disaster happen with about a hundred of my photos. Seems that I was in a hurry to get a shot of the temple while we were riding the tram up to the site from the parking area. I pulled my camera out of my bag and began shooting, without bothering to look at the Mode dial. Unbeknownst to me, the Mode dial had shifted from aperture priority to manual. I happily fired off about a hundred shots before I noticed what had happened. The carnage was terrible. All of the images I had taken, especially those taken in this area, were so seriously over exposed that they were nearly unrecognizable. I'm still shaking dead pixels out of my camera. John is holding court on the top level, discussing the symbolic meaning of the vulture, displayed prominently at this site, and shown in the image below. There is a lesson there, of course. Always check your camera before firing. In spite of being burned so badly here, I still found myself caught up in the moment a couple of other times and fired away without checking. The damage in those cases wasn't nearly as devastating because I did make it a habit to check the camera's screen more often and fixed the problem much sooner. Here is a nice example of the vulture mentioned above. Notice also, the cobras above it. 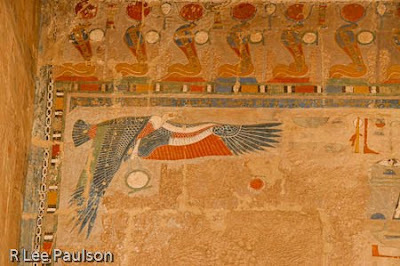 The vulture and the cobra represent upper and lower Egypt, respectively. The two of them are found on the headpiece worn by pharaohs, symbolizing the union of upper and lower Egypt. 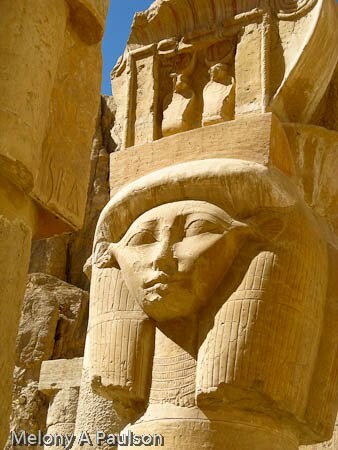 In addition the two of them on the pharaoh's head piece symbolize the reconciliation of opposites. And also symbolize the pharaoh as a reconciler of opposites. Nekhbet, the vulture, was also considered the protector of all Egypt, but especially of infants. She is also the goddess of childbirth. West says this is so because, as an eater of carrion, she represents the creation of new life from death. There is that resurrection principle again. The ancients came at the resurrection principle in many different ways. 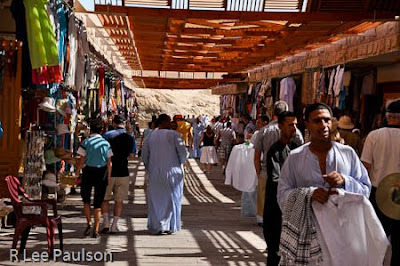 I mentioned a covered bazaar in the first photo, this it what it looked like from the inside. The goods sold in this bazaar are typical of those sold outside most of the temples that we visited. This structure, however, was one of the nicest that we encountered. As I proofread this post, I see yet again that, with these few images, I can only show you a small peek at the reality of this place. In a way, that's not a bad thing. Hopefully, some will be inspired by what they see here to experience the reality of Egypt for themselves. Continue on to Post 29: The River by clicking here.